Anneke Scott and Kathryn Cok demonstrate here that performance on period instruments need not be a dry or academic exercise. In fact, the four works they play here would have little to commend them were they to be played on modern instruments. But the great benefit of the handhorn and the fortepiano is the sheer variety of tones and colours that they are capable of producing, bringing something new to each successive phrase. An interesting, if purely theoretical, debate is often sparked by the performances of virtuoso period instrument players. Namely, when the music was written, were there virtuosi of the same calibre about? And if not, do performances of superior technical skill have any claim to authenticity? In the case of the early 19th century handhorn, the answer to the first question is a definite yes. It was a period when solo handhorn players were rising to superstar status across Europe, and while the quantity of surviving virtuoso music written for them is relatively small, the sheer technical difficulty of the music presented here demonstrates that their skill must have been to a very high level indeed. But first and foremost, this recording is great fun. It is not a history lesson in any sense, and while the historical research behind it clearly erudite, it is the immediacy of the music that leaves a lasting impression. Without the mediation of valves, the horn is acoustically a very simple instrument, if performance-wise a very complex one. And the composers represented make little concession for the physical contortions the player must execute to play their various scales, runs, ornaments etc. Every note of the scale has a different timbre, something Scott is keen to emphasise, while keeping the dynamics and contours of the phrases impressively even. I'll confess to astonishment at the precision of her tuning, and even go as far as to suggest that her 19th century forebears would have made more intonation slips than she does. The compositions are serviceable without being exceptional. 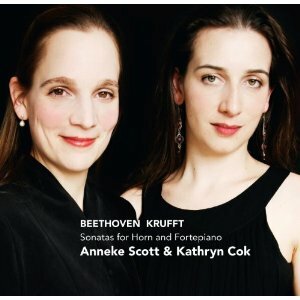 At the risk of offending Beethoven devotees, I would say that the Krufft is the best of them. Like the Beethoven, and indeed the Leidesdorf/Bellonci, it is in a fairly conventional Classical-era style. The sort of music you would normally expect to hear on a clarinet or perhaps a violin. I don't know how many of the ornaments are written into the score, and it wouldn't surprise me if the players are adding in their own complications just for the hell of it. But all the filigree decoration fits well into the style of the work, and the horn writing, or at least the horn playing, at the end of the third movement is as complex as you'll find anywhere. I've never been much of a fan of the Beethoven sonata. The story that it was dashed off on the afternoon of the performance is all the more convincing for the uninspired results. Or so I thought before hearing this. But that insipid conformity that pervades the whole piece when played on a modern horn falls away when presented on a period instrument. The variety of tone colours that the handhorn adds into the mix really makes the piece worth hearing. As I say, the Krufft is more fun, and certainly deserves its top billing on the programme, but this reinvention of the Beethoven is another highlight of the disc. The Largo from Haydn's Rider Quartet, presented here in an arrangement by an unkown hand, offers a few minutes respite before the grand finale of the final sonata. At the risk of labouring the point, I'm not much of a fan of the original of this piece either. But again, the performance on handhorn adds to the interest. It is an interesting demonstration of the fad amongst music publishers in the early 19th century to issue famous works in arrangements for every imaginable combination of instruments. Kathryn Cok is an energetic but sensitive accompanist. Like Scott, she never treats the classical repertoire, nor her historic instrument, with undue reverence, and she plays every piece with energy and spontaneity. Her fortepiano (by David Winston 2007) is in excellent condition with a bright a vibrant sound, but also with just enough of that boxy, nasal quality to distinguish it from its modern relatives. The recorded sound in general is very good, quite resonant but with all the details clearly presented. The liner contains an interesting essay about the works from Anneke Scott. The two handsome photographs of the photogenic performers are welcome, but some photographs of their instruments would also have been of interest. But as I say, this disc is not about the technology upon which the recordings were made, and the 'historical' nature of the whole project is abundantly clear from the sound quality of every note. Instead it is about lively and spontaneous music making. From that point of view, I'd recommend it to anybody, and not just to those with a specialist interest in period instruments.